We are now 16 weeks into the project and it is steaming ahead at a fast pace – In main due to the very hard work of the staff of 3B Construction. 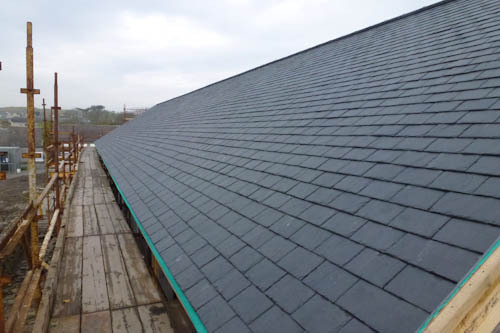 The roof of the hall has been strengthened and now has the solar panels fitted and in place, the roof is also now on the annexe build and inside is starting to take shape, with it now being easy to visualise the spaces and what it is going to look like. The Board of Directors and sub-groups are working very hard in the background to finalise details on such things as the kitchen, the tearoom, retail space and furnishings required, which is taking a lot of time, but exciting at the same time! On Monday 27th January, a Sod-Cutting Ceremony marked the official start of the St Ninian's Hall Annexe building works. Two ‘senior’ Isle of Whithorn residents, Ron Bramley and Billy Brown, both long-standing volunteers in the community, have helped launch the Isle Futures’ project for the St Ninian’s Hall Annexe by lifting the first turf sod. Cheered on by a large group of villagers, and accompanied by Robert Marr of 3b construction, this was the official celebration to mark the start of a seven-month building project that will bring a new building equipped with tea room and shop, as well as a visitor reception facility, and which will augment the existing award-winning Hall. 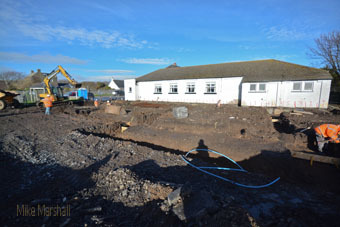 After a short period of site preparation, including removal of trees, equipment and storage facilities were brought on site, and early Monday morning saw the demolition of the public toilets and the start of groundworks for the Annexe foundations. For regular updates on the building development, visit the Isle Futures website. We’re delighted to announce that Sharon Cameron has been appointed Hall Manager of St Ninian’s Hall. Pictured here with a model of the new Annexe. Sharon has extensive experience working with voluntary and charitable organisations, statutory bodies and agencies. She has wide knowledge of managing projects and facilities, marketing initiatives, finance and funding, health and safety, and governance. 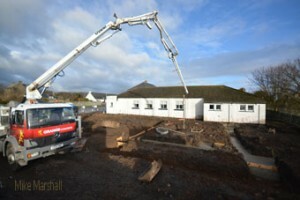 Sharon joins Isle Futures at an exciting time in the early stages of the St. Ninian’s Hall Development Project. 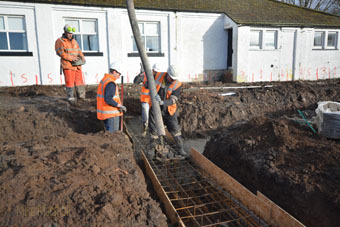 Following the momentous announcement of the grant funding award for the St.Ninian’s Hall Development project by the Big Lottery in April, Isle Futures and Smith Design Associates in Dumfries, the architects appointed to manage the project build have been meeting regularly during the summer. Invitations to tender were issued to six contractors with all responding by the requisite time in late July. Isle Futures needs as many people as possible to have a say in the running of the Company. You can do this by becoming a Member of the Company. It costs nothing to join! 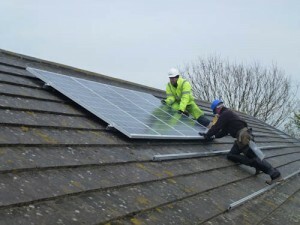 More information available on www.islefutures.co.uk or contact Hugh Jaques, Company Secretary on 01988 500686. Isle Futures have now received notification from the Big Lottery that its funding application to develop St Ninian’s Hall has been successful. As previously reported, the project will involve the construction of an annex to the hall which will double the size, providing a café/tearoom facility, retail outlet, exhibition area, and new public toilets. These facilities, with all ability access, will complement the existing hall which currently does not meet the requirements for its wide range of users. Planning for St Ninian’s Hall annex has been approved by Dumfries and Galloway Council. Construction is due to commence towards the end of this summer with the opening scheduled in Spring 2014. St. Ninian’s Hall has seen the continued support from existing users and a substantial increase in bookings from new users and events. These have included Newton Stewart Probus Club, Wigtownshire Countrywomen’s Luncheon Club, and the Stranraer Inner Wheel. The ‘Emma Louise Dancers’ are now firmly established as a regular hall user with classes being held each week. Since taking over the management from D & G Council four years ago the number of local groups as regular users has increased. These now include the Youth Group, the Thursday Club, Tai Chi, Line Dancing classes, Mothers and Toddlers Group and members of the Isle Church of Scotland congregation. Machars Movies continue with regular film screenings and the ‘Film and Food’ theme evenings are a particular success. Their programme for 2013 is due to be announced very shortly. The hall featured this year in the ‘ Open Doors’ weekend event which provided an ideal marketing opportunity to encourage bookings for private and public functions. The flexible catering arrangements and provision of a licensed bar are both features which make the hall an attractive venue. The hall’s continued success is reliant on the contribution from many volunteers. This ranges from the work undertaken regularly to maintain the fabric of the building and on-going decoration, to the catering provided for functions and events and monitoring and ordering of the bar and kiosk stock. Without their involvement, the hall would cease to function as the vibrant centre it is. 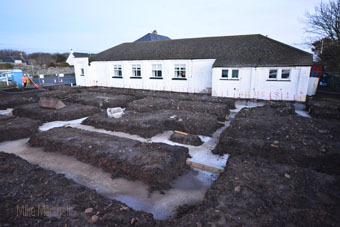 It was very pleasing to see planning permission for the new annex was approved by D & G Council in October. Progress concerning ownership of the existing building and green, a pre- condition of funding for the new annex, has been disappointingly slow. However, it is hoped that the purchase will be finalised within the next few weeks. The funding application for the annex has progressed to the next stage of the process with the Big Lottery. Isle Futures and members of St. Ninian’s Hall Management Committee are confident the community will have a facility to be proud of and one which reflects its needs and aspirations. With the mandate from the community to progress with the project to enhance the facilities at St Ninians Hall, we submitted 5 funding bids, totalling over £500,000 to fund the New Facility. Initial feedback from the National Lottery and LEADER (European funding) was extremely positive, although we didn't fully meet their criteria, they reported that we were on the right road. They provided the trustees with feedback guiding them as to how the applications could be improved to meet their requirements. The trustees were invited to resubmit the applications in the new year, a situation which does not occur very often. 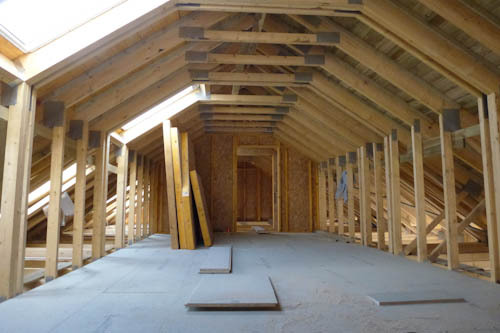 Our other three funding bids to smaller funders are due to be considered very soon, and it is hoped that this will fund the final architectural drawings and planning permissions. Final drawings will be displayed for public information and comment. With the first year under our belt, we thought it was about time to show you what improvements we have made. As you can see below we have fully repainted the outside, but it is inside where most improvements have been made. Now available for bookings for all events, weddings, parties, receptions, conferences, film nights, talks, musical events, whatever, including private cinema screenings. Why not have your group or organisation come and watch a film of your choice on the big screen and enjoy refreshements in the comfort of this wonderful new venue. Saturday 21st.March, saw the next painting party which has taken to exterior of the hall to be almost finished. Again a huge thank you to every one who helped, with special mention to the "dinner ladies" who served everyone with coffee and hot soup and rolls. Wonderful. IT WAS A TIGHT FIT BUT....! 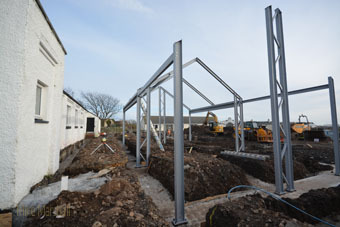 Last Friday our steel storage container finally arrived and was to be sited down the north side of the hall. Under the superb direction of the vision in orange, hall manager Bob Rowley, it went remarkably easily. Here is a story board of the installation. A huge thank you to Darren Kelly for his superb manouvering in the fork lift, 3b Construction, D&G Council for the container and Luce Bay for the transport. All we have to do now is seal it and paint it. Easy!! Last Saturday the external redecoration got under way with a Painting Party which was well attended by about a dozen folk, wielding paint brushes and rollers with reckless abandon! A huge thank you to everyone who came along, and to the 'Catering Crew'; who kept everyone fed and watered. NEXT PAINTING PARTY - SATURDAY 21ST MARCH 10am - 12pm. Monday morning saw the long awaited upgrade to the faclities at the hall to comply with the Disability Discrimination Act. 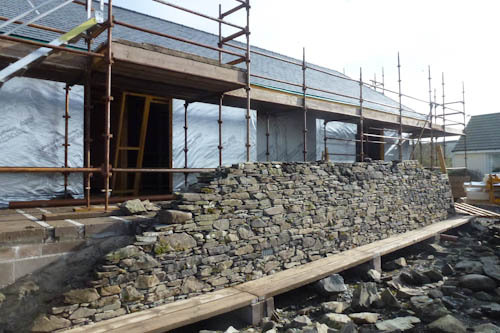 A new disabled toilet inside the ladies, new ramp at the front of the hall, an extended ramp at the side entrance, new outside lights on the shore side, and other amendments to help wheelchair users to navigate through the building. We are working with the Local Authority to have changes made to the gents toilet as well in order that disabled users can use a toilet appropriate to their gender. That change will hopefully come later this year. Things are now starting to move at a pace. The Disability Discrimination Act refurbishment work started yesterday (Mon 2nd March) and if it goes to plan will be finished by Friday. This will give us a disabled toilet, improved external lighting, a new ramp at the front door, an improved ramp at the side door, and improved visibility for wheel chair users on the internal doors. In addition, we have now had approval to order the cinema equipment which we have done. The new blackout blinds are bought as the new curtain poles. A sewing bee is being formed as we speak to sew up the new curtains ready for hanging. We have an application into Dulux for a grant to purchase paint for the hall. 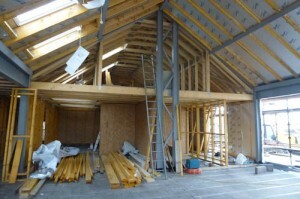 The wiring for the new cinema will be completed this week. The exterior of the hall is under going powerwashing in preparation for the painting, and watch this space for notification of the painting party. The new chairs are due for delivery next week (w/c 9th March). We will endeavour to keep the disruption to the use of the hall to a minimum, but ask for everyone's patience should there a little inconvenience. The floor has to be sanded and re-varnished and re-lined. The colours for the walls has been decided. 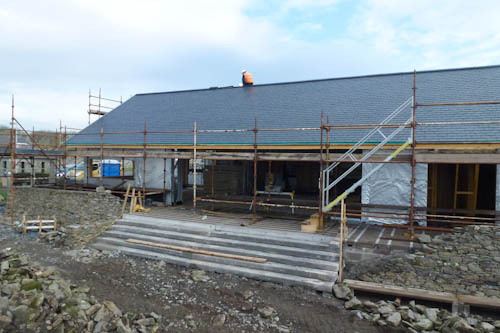 The external walls are to be white with black rone pipes and window sills and guttering. The internal walls are to be a pale cream on top with a pale green on the bottom to match the green curtains. Due to the funding proceedures, the new curtain track for the stage will not be in place immediately. CGR Home Improvements won the contract to replace all the external doors and make the internal alterations necessary for the cinema control room. Unfortunately bureacracy took over and we were told at the last minute we needed a building warrant, and our attempts at fast tracking drawings met with failure and we have had to engage an architect. At this time we await the drawings so we can summit our building warrant request and make the alterations. We have also made a funding bid for funds to replace the lighting and heating in the hall. The lighting must be changed as it does not conform to health and safety regulations. The heating is expensive and really doesn't heat the hall properly. We await the results of this bid as the cost will be in the region of £9,000. We will keep you up to date with the developments as they happen. The refurbishment has now begun and is well under way. The roof repairs have been completed, the roof cleaned of moss and the guttering and down pipes repaired or replaced as required. I want to thank Jason McGuire for a splendid job. We have now sold all the old benches and even managed to sell the piano. Well done Bob on that one. New plumbing has been installed in the public toilets to reduce the amount of water used in the gents urinals. From April we will be charged for all water used through a meter. The new chairs are due for delivery soon, and we have the curtain material ready to be made up into the new curtains. 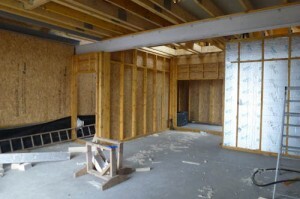 We intend to put up nice new poles for the curtains, and install blackout blinds to accommodate the cinema. The cupboard at the rear of the hall ( to the right of the main doors as you come in) is being converted into a control room for all the various technologies. Tenders have gone out for this work, and a contractor appointed. This requires the door to be moved and an observation window created. We are having extra electrics installed as well. We have also put out to tender the replacement of all the external fire doors which are now in an extremely poor state of repair. This is now an urgent item in the refurbishment as we will require a fire safety inspection in the near future. We ask that parents encourage their kids NOT to kick footballs off the new doors when fitted. We are considering new security measures for the hall in light of the added equipment. We have now received all the tenders for the supply of the cinema equipment and have, in association with Scottish Screen, appointed AVC-Electrosonic of Edinburgh. 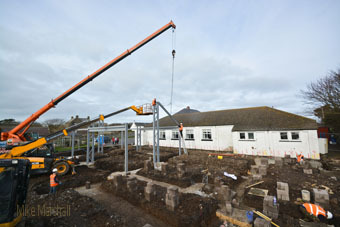 We have now ordered the equipment and are still on track for a first screening in April 2009. All the underfloor cabling for the hall sound and lighting has been installed. The blackout blinds and curtain poles purchased. We have applied to Dulux for a grant of free paint under a community scheme they run. The new chairs are due any day now, as is the storage container. Its all go. Please look out for notification of painting parties in the very near future. Coming soon ... Scotland's most Southerly Cinema! In 2009, the village hall will become Scotland's most Southerly cinema. Isle Futures has been awarded a grant of £10,000 from Scottish Screen’s Digital Projection Equipment Programme to provide state-of-the-art equipment at the Hall. This equipment will include high quality, high definition projection and surround sound, which can be used for cinema-style screenings, as well as for any other events or individual users that require the facility in the hall. We will be planning a regular programme of features (not necessarily first release), documentaries, shorts, animated films etc., that are usually outside the scope of larger cinemas. There is a wealth of excellent material that is largely unseen, and there is an even larger wealth of material that many would like to see again – classic movies in particular. And, we can now plan to build new events and enhance existing attractions to the area - local film-based events and festivals; residential courses for beginners on video and audio-visual production, as well as music and radio production. We have now created Machars Movies, a film society, a member of the British Federation of Film Societies, and has a committee comprising of representatives from communities throughout the Machars. They are working towards an opening night in April (renovations and installation permitting) Watch these pages for more news. Over the last few weeks Isle Futures has had detailed consultations with Smith Designs of Dumfries, the architects appointed to undertake the planning work for the development of St Ninian’s Hall. The plans are now complete and have been submitted for planning permission. In order to keep all members of the community up to date, there will be an opportunity to view and comment on the plans at a public open evening in the hall on Friday 25th May from 6pm to 9pm. Isle Futures trustees and the architect, Jeremy Brown of Smith Designs, will be available advise on the plans and discuss any points that may require clarification. Receiving feedback from the public about the new facilities is welcomed. Comment forms will also be available. The views of the community are important to the development of the project for the greatest benefit of everyone, Isle Futures and funders. Good progress is being made with the application for funding; the fist stage submission to the Big Lottery has been completed. Negotiations with Dumfries and Galloway Council on the purchase of the hall, a condition for funding the new development, are continuing and it is anticipated that the matter should be concluded in the next few weeks. Isle Futures looks forward to as many as possible coming to the open evening to look at the plans and discuss details of this important new development. If you have problems getting to the meeting for whatever reason, please contact Hugh Jaques, Company Secretary - Telephone 500686 and alternative arrangements can be made for you to see and discuss the plans. Isle Futures is grateful to Leader for project development financial support to bring the project to the planning permission stage.